(Construction) – A Medal "For the People's Health" by the Ministry of Health was given for Mr. Mitsuhiro Ushio for his contributions to Vietnam's health sector. 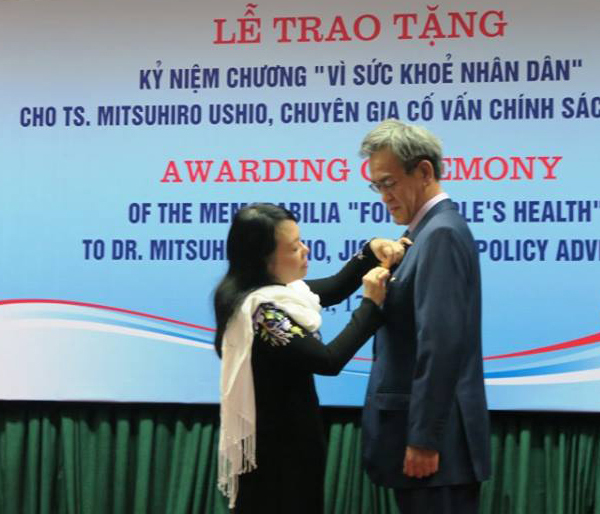 Recently, Jica's Policy Advisor – Mr. Mitsuhiro Ushio were awarded the Medal "For the People's Health" by the Ministry of Health for his contributions to Vietnam's health sector as consultation on health and its policy. At the ceremony of awarding the Medal "For the people's health", Minister Nguyen Thi Kim Tien attended, awarded certificate of merit, medal and shared the deep thanks for the contributions of the main advisor of Oshio for 2 years and 8 months in Vietnam.